Revised estimates of mutation rates bring genetic accounts of human prehistory into line with archaeological data. The story of human ancestors used to be writ only in bones and tools, but since the 1960s DNA has given its own version of events. Some results were revelatory, such as when DNA studies showed that all modern humans descended from ancestors who lived in Africa more than 100,000 years ago. Others were baffling, suggesting that key events in human evolution happened at times that flatly contradicted the archaeology. The concept of a DNA clock is simple: the number of DNA letter differences between the sequences of two species indicates how much time has elapsed since their last common ancestor was alive. But for estimates to be correct, geneticists need one crucial piece of information: the pace at which DNA letters change. Geneticists have previously estimated mutation rates by comparing the human genome with the sequences of other primates. On the basis of species-divergence dates gleaned — ironically — from fossil evidence, they concluded that in human DNA, each letter mutates once every billion years. “It’s a suspiciously round number,” says Linda Vigilant, a molecular anthropologist at the Max Planck Institute for Evolutionary Anthropology in Leipzig, Germany. The suspicion turned out to be justified. In the past few years, geneticists have been able to watch the molecular clock in action, by sequencing whole genomes from dozens of families5 and comparing mutations in parents and children. These studies show that the clock ticks at perhaps half the rate of previous estimates, says Scally. 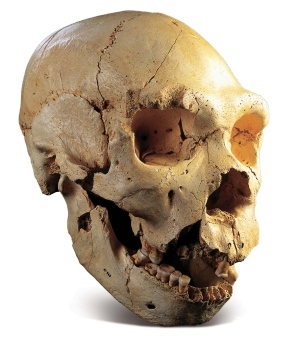 In a review published on 11 September1,Scally and his colleague Richard Durbin used the slower rates to reevaluate the timing of key splits in human evolution. “If the mutation rate is halved, then all the dates you estimate double,” says Scally. “That seems like quite a radical change.” Yet the latest molecular dates mesh much better with key archaeological dates. A slower molecular clock could also force scientists to re-think the timing of later turning points in prehistory, including the migration of modern humans out of Africa. Genetic studies of humans around the world have suggested that the ancestors of Europeans and Asians left Africa about 60,000 years ago. That date caused many to conclude that 100,000-year-old human fossils discovered in Israel represented a dead-end migration rather than the beginning of a global exodus, says Scally. Scally’s calculations put “out of Africa” closer to 120,000 years ago, suggesting that the Israeli sites represent a launching pad for the spread of humans into Asia and Europe. The latest genetic dates also fit with several sites in the Middle East that contain tools apparently made by modern humans but dating to around 100,000 years ago. At that time, sea levels between Africa and the Arabian Peninsula were lower than they are now, and a wetter climate would have made the peninsula lush and habitable, perhaps beckoning modern humans out of Africa. Rose, who works one such site, in Oman, says that he “has been over the moon” since reading Scally and Durbin’s paper. The revised molecular clock may also help to settle a debate over whether humans ventured further into Asia more than 60,000 years ago, says Michael Petraglia, an archaeologist at the University of Oxford, UK, who favours an early date. For instance, the slowest proposed mutation rate puts the common ancestor of humans and orang-utans at 40 million years ago, he says: more than 20 million years before dates derived from abundant fossil evidence. This very slow clock has the common ancestor of monkeys and humans co-existing with the last dinosaurs. “It gets very complicated,” deadpans Reich. Some researchers, including Scally, have proposed that the mutation rate may have slowed over the past 15 million years, thereby accounting for such discrepancies. Fossil evidence suggests that ancestral apes were smaller than living ones, and small animals tend to reproduce more quickly, speeding the mutation rate. Scally, A. & Durbin, R. Nature Rev. Genet. 13, 745–753 (2012). Langergraber, K. E. et al. Proc. Natl Acad. Sci. USA http://dx.doi.org/10.1073/pnas.1211740109(2012). Hawks, J. Proc. Natl Acad. Sci. USA http://dx.doi.org/10.1073/pnas.1212718109 (2012). Sun, J. X. et al. Nature Genet. http://dx.doi.org/10.1038/ng.2398 (2012). Kong, A. et al. Nature 488, 471–475 (2012).